Like Neptune, AD HOP is one of Liverpool’s newest breweries. This enjoyable and interesting beer is labeled a saison but drinks more like a Flemish red. Tart berries dominate the acidic aroma, and the same tartness also controls the taste. More berry fruit splashes around the palate, but ultimately it is the acidity tingling the throat that you notice before a bone dry, acidic finish with more berries. It’s not quite as rounded as a classic sour like Rodenbach, but those guys have had the best part of 200 years to get their act together. AD HOP has been open a matter of months. As a style, saison is a moveable feast: no two breweries in the French-speaking region of Belgium produce identical beers. It’s thought some of the original farmers who brewed saison used wine yeasts and stored the beers in wine casks, so AD HOP in Liverpool may not be bending the rules too far with its interpretation. 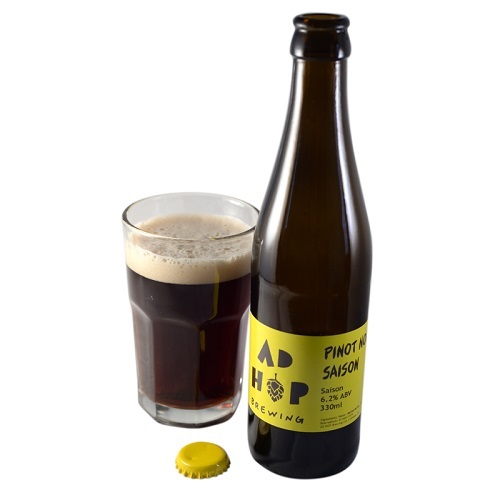 The beer has a flaring ruby-red color and an acidic, funky nose from the must and wild yeasts in the wood. The aroma also has powerful notes of creamy malt, vanilla and chocolate. The palate is challenging: tart, acidic, with peppery hops, rich malt and continuing notes of vanilla and chocolate. The finish is more bittersweet but still dominated by acidic notes, chewy grain and fading hops.